The wildlife of Prague is very rich especially with regard to birds of prey. We documented numerous breeding sites of Buzzard (Buteo buteo), Marsh Harrier (Circus aeruginosus), few nests of Goshawk (Accipiter gentiles), Honey-buzzard (Pernis apivorus) and one permanent nest of Peregrine Falcon (Falco peregrinus). The most numerous are Kestrels (Falco tinnunculus) followed by Sparrowhawks. Since 1985, the study of the sparrowhawk population in Greater Prague (cca 500 square km) has each year given a picture of the distribution of nests. Each year the important ecological, individual and breeding data were collected. There are 120 stable and 30 occasional nest sites within the central area of about 220 square km. As not all places are continuously occupied, the number of breeding pairs in particular years fluctuates between 60 to 92. For Greater Prague with rural areas close to borders we estimate up to120 breeding pairs in some years. During the past few years 50-75% of breeding birds were physically examined every season. Since the breeding season of 1989, color wing tags are used to gain better knowledge of the breeding individuals. Each year the maximum fledglings have been ringed. Similar method of data collection was used within the surrounding area near the borders of Greater Prague (about 50 nest sites). Thus, two sets of data, those from urban (central) and rural area (outskirts) can be compared. The density of nests in some places within the central area is very high. In some cases we counted 150-210 ha per pair. The Prague average is about 600 ha per pair. Each year some nests have been found closer than 200m apart. 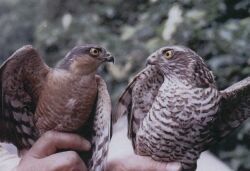 Long-term changes in the breeding density of sparrowhawks revealed high fluctuations till 1993 but since that the number of breeding pair remains almost stable in the level of about 60 pairs. (1) Rural populations of sparrowhawks typically locate their nests on spruce, pine or larch. In Prague they frequently use also broad-leaved trees (25 %), which is for Bohemia an exception. (2) Urban sparrowhawks start to breed generally earlier than those living in the countryside. (3) Differences in timing from year to year are smaller in urban than in rural populations. Only a smaller part of yearlings generally breed in rural populations. At Prague, the number of breeding yearlings is relatively high in some years. Sparrowhawks (and other raptors with later sexual maturity) have thus an effective reserve in the reproductive potential of yearlings. They can stabilize the reproduction after e.g. bad winters and a successful breeding of yearlings can cause a population growth in years or areas with good feeding conditions. Yearlings breed later than adults, generally in the second half of the breeding season. The breeding period in Prague is therefore prolonged. Yearlings move from birthplace to their first breeding place a mean distance of 5.3 km for males and 8.8 km for females. Analysis shows that the age of males is crucial for the timing of breeding. The older birds tend to breed earlier in the spring. If we take egg-laying time for adult males only, then the fluctuation from year to year will be largely determined by annual differences in the suitability of the weather in winter and early spring. The relationship between mild winters and early breeding in1988-90 is evident for both, urban and rural birds. The structure and extend of the urban environment at Prague is large enough to support stable, relatively independent population of Sparrowhawks. The breeding of these adapted birds is altered due to special conditions within the town.